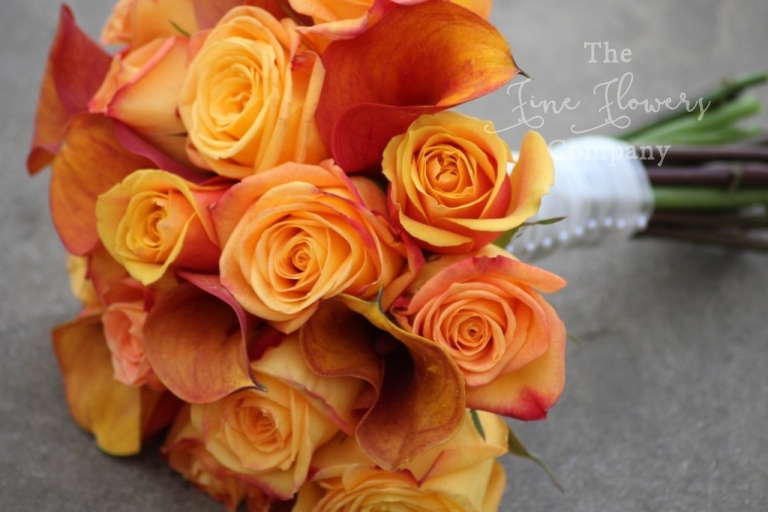 For these vibrant Pembroke Lodge wedding flowers, the lovely autumn bride Maddi, imagined a rich burnt orange colour scheme but fresher and more romantic, with lots and lots of candlelight rather than the more typical autumnal wedding with browns and berries and so on. Here is an overview of what we created for her. 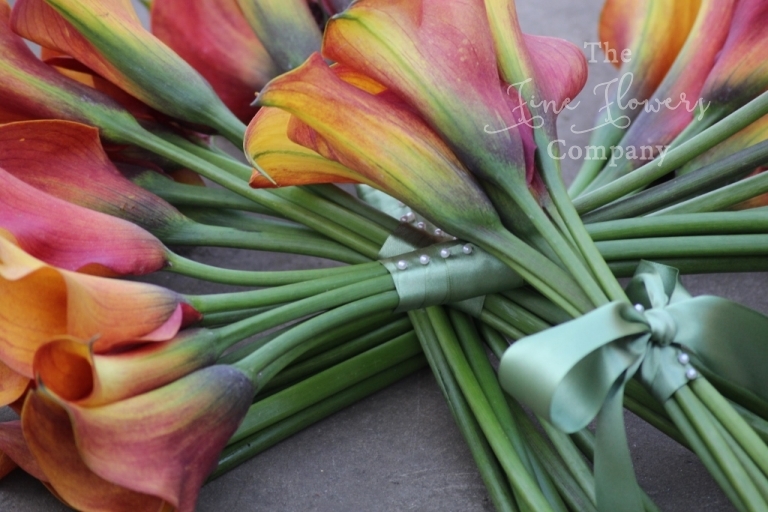 Maddi carried a bouquet of rich orange roses and burnt orange Mango calla lilies, while the 4 bridesmaids and the younger flower girl had coordinating simple handtied bouquets of elegant Mango calla lilies, to contrast against their fresh sage green dresses. 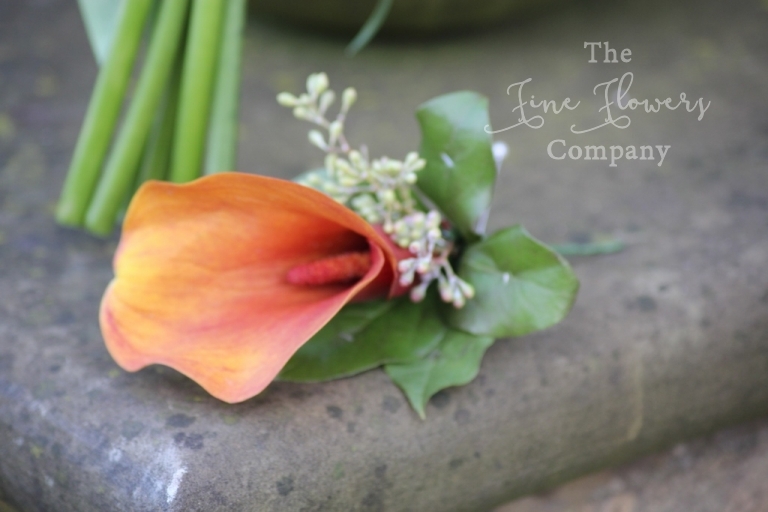 For this Pembroke Lodge wedding we created two rustic twig centrepieces with burnt orange calla lilies and cymbidium orchids, and pretty hanging lanterns, to frame the ceremony table, and placed a matching display on the assitant registrar’s table. 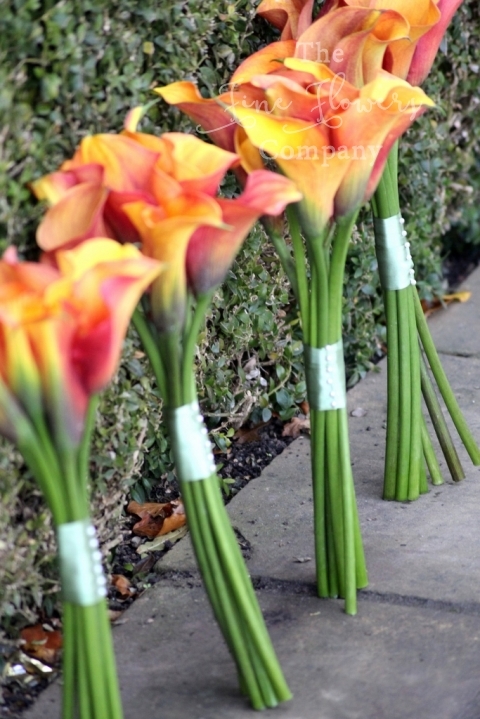 The ceremony table was dressed with a line up of pretty vases with orange roses and calla lilies, and joint together by romantic votives and petal scatter. For the tables, we reused all these displays and added extra ones, to dress the guest tables all slightly differently, some with a taller centrepiece, some with just one of the lower centrepieces and the top table with a cluster of 3 pretty vases of flowers. Again, all of them surrounded by pretty candlelight and rose petal scatter. If you are planning a Pembroke Lodge wedding and need more ideas and inspiration, please visit our Pembroke Lodge wedding flowers gallery page, or search our website for ideas from other venues to see differet styles and colour schemes. In the meantime here are some more photos from this lovely wedding.